December 19, 2010 - Boeing has submitted its proposal for the second round of NASA’s Commercial Crew Development (CCDev) program. Boeing plans to advance the design of its Crew Space Transportation (CST)-100 spacecraft and Commercial Crew Transportation System and continue to demonstrate key technologies. NASA’s Commercial Crew and Cargo Program is applying Recovery Act funds to stimulate efforts within the private sector to develop and demonstrate human spaceflight capabilities. These efforts are intended to foster entrepreneurial activity leading to job growth in engineering, analysis, design, and research, and to economic growth as capabilities for new markets are created. By developing commercial crew service providers, NASA may be able to reduce the gap in U.S. human spaceflight capability. The Program intends to solicit proposals from all interested U.S. industry participants to mature the design and development of commercial crew spaceflight concepts and associated enabling technologies and capabilities. NASA plans to use its Space Act authority to invest up to $50 million dollars in multiple competitively awarded, funded agreements. This activity is referred to as Commercial Crew Development, or CCDev. An Announcement soliciting proposals for Space Act Agreements (SAAs) is currently planned to be released on or about August 10, 2009, with proposals due approximately 45 days later. "In the same way that Boeing helped launch commercial aviation more than 80 years ago, we are working to develop what could become a true commercial space transportation system: a commercial service to take people to the International Space Station and other Low Earth Orbit destinations," said Brewster Shaw, Boeing Space Exploration vice president and general manager. "We plan to further mature our design and continue the development process toward our first crewed flight in 2015." Boeing is proposing an approach that will significantly mature the CST-100 design through demonstrations of critical subsystems. The CST-100 spacecraft is designed to support NASA's primary objective of affordable access to Low Earth Orbit. It will carry up to seven crew and passengers, is reusable up to 10 times, and is compatible with a variety of expendable launch vehicles. The spacecraft which is comprised of a Crew Module and a Service Module draws on Apollo-proven aerodynamic characteristics in a design that uses commercial, off-the-shelf, cost-effective technologies. - Demonstration of airbag land landing, water landing, post-water landing uprighting and life-support systems. 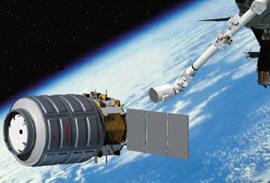 "We look forward to continuing our joint efforts with NASA to ensure CCDev’s success,” said Shaw. “Enabling commercial-crew access to Low Earth Orbit allows NASA to focus on deep space exploration and thereby ensure a continued leadership role for the U.S. in human spaceflight for generations to come."